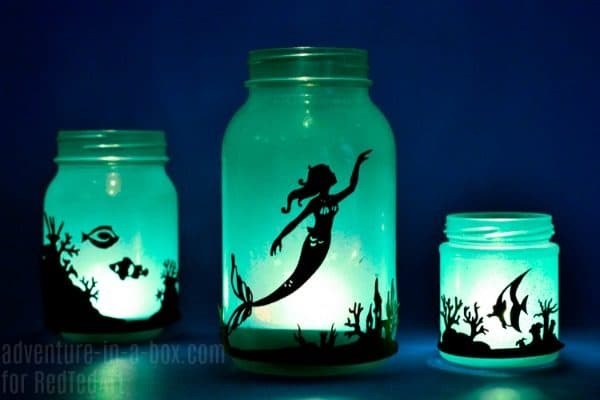 Upcycle mason jars and turn them into a set of lanterns with magical silhouettes of mermaids and fish set against the luminescent background of the sea. 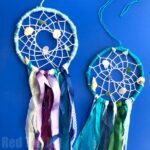 Great for atmospheric décor, whether for a backyard patio or a sea-themed celebration! Note: This list contains affiliate links, should you choose to purchase via this list, the site will earn a small commission that goes towards the upkeep of the site! Find out more here. First, prepare the jars. For a set of three, I recommend a standard half-pint mason jar, a small jam jar and a big pickle jar. Before applying paint, wash them thoroughly. If possible, finish washing with a bit of alcohol – it degreases the glass and removes any sticker residue or codes printed directly on the glass. 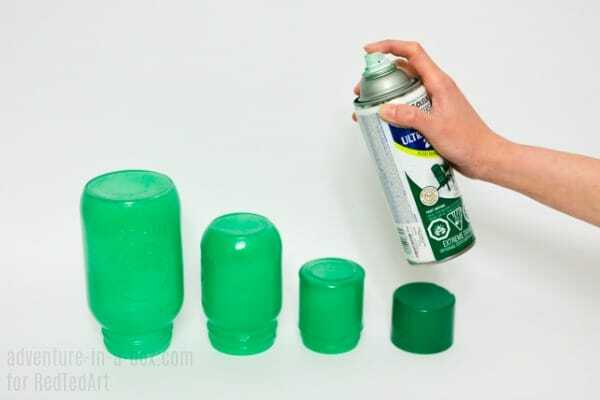 Spray paint the outsides of the jar. Either Krylon or Rust-Oleum spray paint would work. You can try different shades of blue or green that these brands offer. I used Meadow Green Gloss, and I think that Seaside Gloss would also look beautiful. 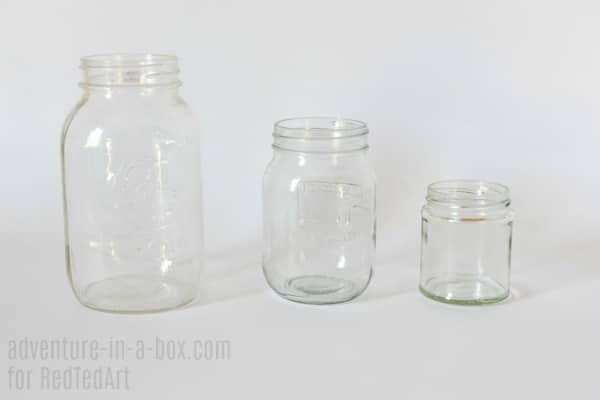 Be careful to leave the jars translucent by spraying a very thin layer – not at all the way you would usually apply spray paint – more like a layer of deliberate over-spray. 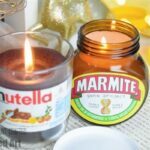 Once the paint is dry, drop a candle inside one of the jars and see how the light comes through. If the light isn’t coming through, the layer of paint is too thick, and you need to try again with a different jar. Let the paint dry thoroughly, according to the instructions on the can. Usually, the jars are ready in half an hour. 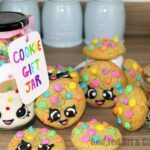 Now, there are several ways of putting the design onto the jars. Here I’m going to describe how to cut and glue the designs onto the jars, which is my favourite way. 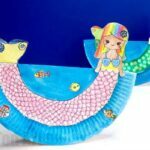 But you can also draw the designs onto the jar with markers or paint them with a mix of acrylic and glue paint. 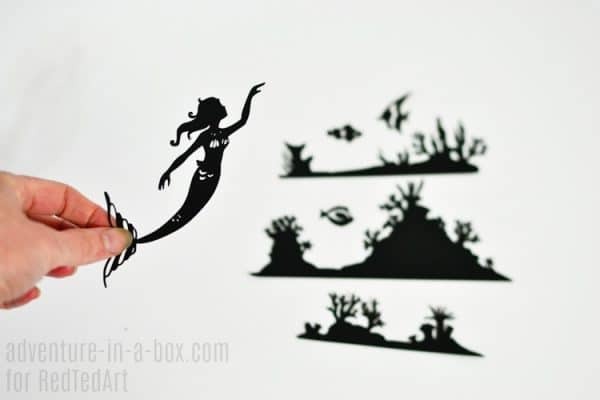 If you plan to make the designs with paper cutouts, you can do so by printing the designs on the standard printer paper, but if you happen to have black paper that you can print on, that will work even better. Then you don’t have to be as careful in following the design when cutting, and there are no unseemly white edges around the designs when they are cut. 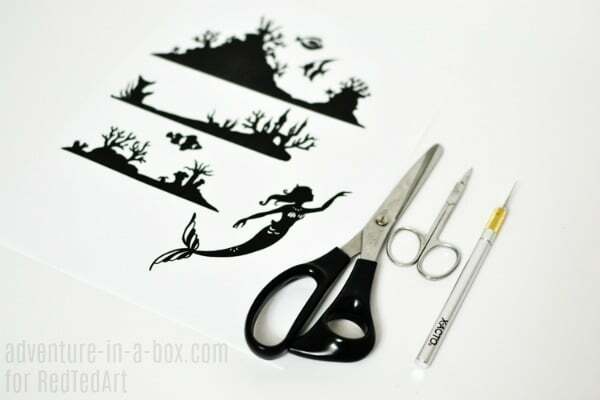 Use standard scissors for cutting big pieces out, and small manicure scissors for intricate parts. 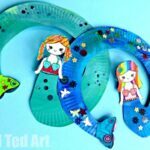 A craft knife is excellent for making cuts inside of the design, like mermaid scales. Here you can watch a video tutorial of the cutting process I made for a different set of lanterns. 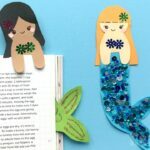 Have a Cricut Machine or a Silhouette Cameo? It would work great! You need to import the design into your library – it will only take a minute. 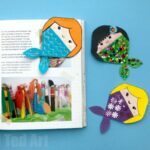 Here is my tutorial for how to do it with a Cricut Machine, and here is the tutorial for Silhouette Cameo. 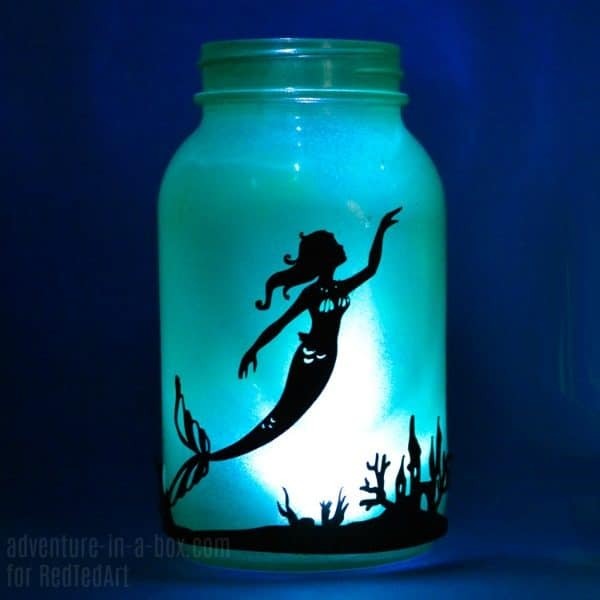 After you got the silhouettes, glue them onto the jars with white glue that dries clear, like Elmer’s or Weldbond. 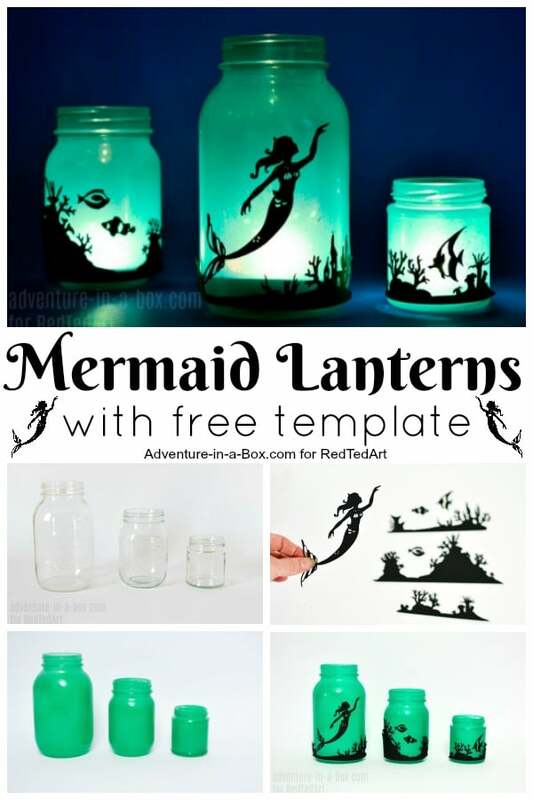 Step 4: Add Candles and make your Mermaid Lanterns GLOW! For these marine lanterns, cold white LED candles will give just the right atmosphere. Since the jar is translucent, the light of the candle comes through at the bottom of the jar and creates a magical gradient effect. 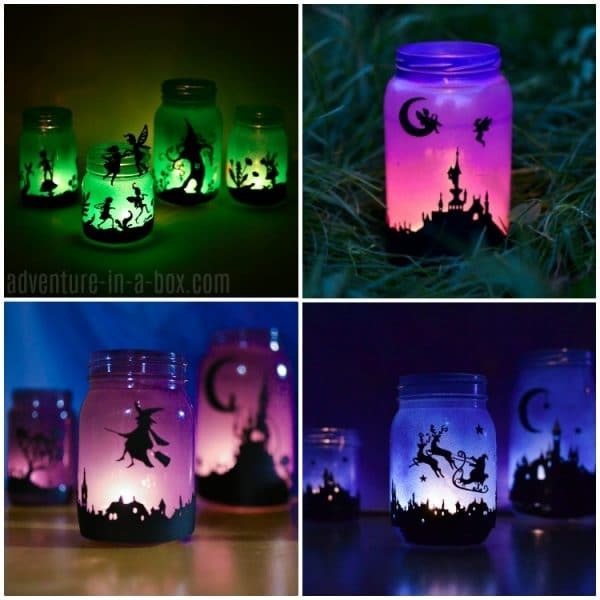 More Magical Mason Jar Lantern Designs? Visit Adventure in a Box today!! Below you will find Mason Jar Lantern links for every season – from “spooky” (but beautiful) Halloween to, Christmas Lanterns!